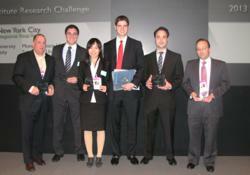 Fordham team advances to Global Final to present their research on Microsoft in London, UK. It is a tremendous opportunity to be able to formally use the skills we learn as students and showcase them in a forum where industry experts can critique and evaluate our performance. Fordham University was selected as the winner of the New York Regional Final of the CFA Institute Research Challenge®, hosted by the New York Society of Security Analysts at Bloomberg Headquarters in New York City on March 4, 2013. Ken Boswell, Paul Kearney, Jonathan LaSala, and Elaine Lou led Fordham to the title. They competed against Montclair State University, Pace University, and Seton Hall University. Each team presented their research and buy/sell/hold recommendation on Microsoft Corporation. Founded in 1975, Microsoft’s mission is to enable people and businesses throughout the world to realize their full potential by creating technology that transforms the way people work, play, and communicate. The company develops and markets software, services, and hardware that delivers new opportunities, greater convenience, and enhanced value to people's lives. Microsoft does business worldwide and has offices in more than 100 countries. The Fordham team will advance to the Global Final to face teams from Asia-Pacific, Europe, and other North American teams on April 12, 2013 in London, UK. The CFA Institute Research Challenge is sponsored by CFA Institute. eFinancialCareers and Bloomberg are the New York Regional Final sponsors. The Challenge is a global competition which tests the analytic, valuation, report writing, and presentation skills of university students. For more information on the New York Regional Competition, please visit http://www.nyssa.org/research-challenge. The New York Society of Security Analysts (NYSSA) is a leading forum for the investment community. NYSSA’s mission is to promote best practices and the highest professional and ethical standards in the industry. With nearly 10,000 members, NYSSA is the largest of the 135 societies worldwide that make up CFA Institute, which has over 105,000 members.